Mr. L. is a white man, age 67, who presented after several weeks of personality changes, paranoid behavior, emotional lability, and encephalopathy. At admission, he experienced a generalized tonic-clonic seizure and was found to have hyponatremia (Na+ = 119 mEq/L), which was treated. When his sodium levels had normalized, he was discharged. Later he returned, having another generalized tonic-clonic seizure and was again noted to have hyponatremia. Despite sodium correction, his mental status continued to deteriorate. He appeared confused with difficulty remembering, paranoia, and emotional lability. 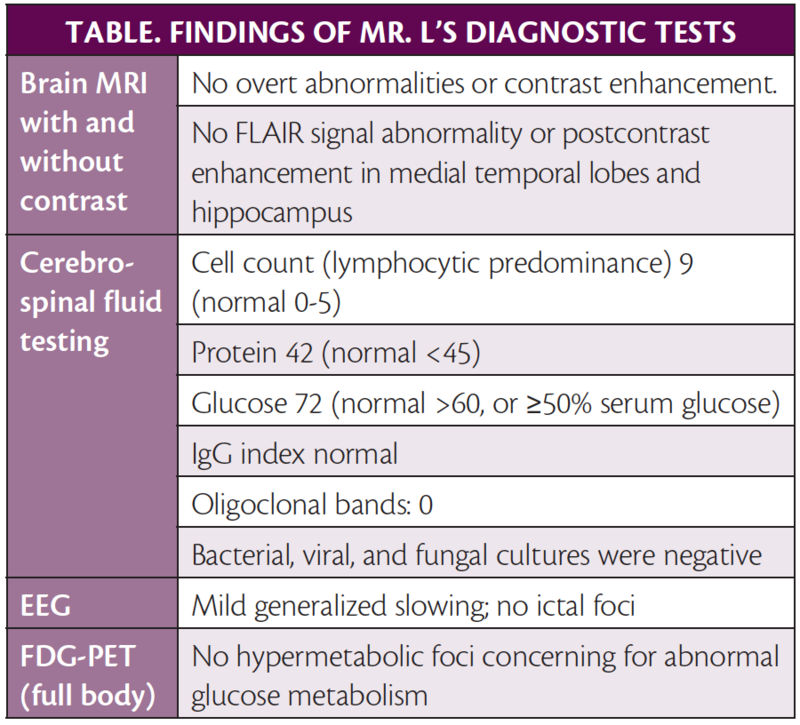 Mr. L had a brain MRI with and without contrast, lumbar puncture and cerebrospinal fluid (CSF) analysis, video-EEG, a full-body fluorodeoxyglucose positron emission tomography (FDG-PET) scan, and serum antibody testing (Table). He also had video-EEG that showed mild generalized slowing but no ictal foci. During monitoring, he had subtle twitches of the left side of the face, shoulder, and arm intermittently. Serum and CSF were sent for an autoimmune encephalitis panel test, and results were positive for antibodies to leucine-rich glioma-inactivated protein 1 (LGI1), confirming the diagnosis of anti-LGI1 autoimmune encephalitis. Mr. L. was treated with intravenous high-dose steroids, and his encephalopathy and hyponatremia gradually resolved, with some persistent difficulties with memory. He subsequently received 1 gram rituximab to achieve B-cell depletion in an attempt to decrease the risk of relapses. At 6-month follow-up, he was relapse free and improving. 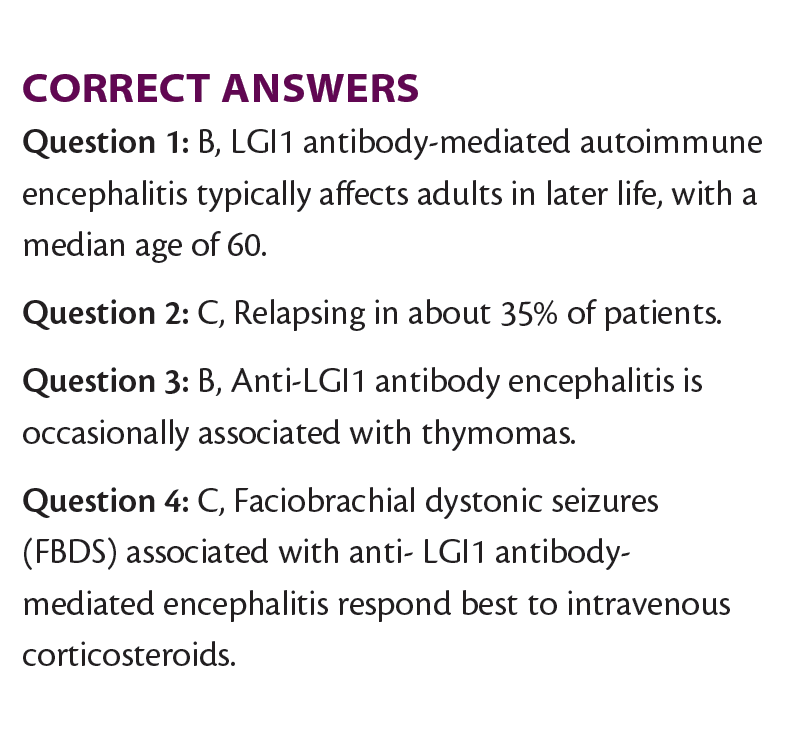 Anti-LGI1 antibody-mediated encephalitis is only rarely associated with tumors, including thymoma.6,7 The majority of cases are nonparaneoplastic autoimmune in etiology. Anti-LGI1 antibody-mediated encephalitis typically responds well to intravenous corticosteroids followed by prednisone taper, but about 35% of patients experience relapses. Patients must be weaned off steroids slowly, and preventive treatment with rituximab, which depletes B cells, should be considered because of the risk of relapse.7,8 It is not known for how long rituximab should be continued, but most clinicians will continue it for 1 to 2 years, administered every 6 months, and then attempt to stop. 1. Van Sonderen A, Schreurs MW, Wirtz PW, Sillevis Smitt PA, Titulaer MJ. From VGKC to LGI1 and Caspr2 encephalitis: the evolution of a disease entity over time. Autoimmun Rev. 2016 Oct;15(10):970-974. 2. Lai M, Huijbers MG, Lancaster E, et al. Investigation of LGI1 as the antigen in limbic encephalitis previously attributed to potassium channels: a case series. Lancet Neurol. 2010;9(8):776Y785. 3. Blume WT, Lüders HO, Mizrahi E, et al. Glossary of descriptive terminology for ictal semiology: report of the ILAE Task Force on Classification and Terminology. Epilepsia. 2001;42(9):1212-1218. 4. Bien CG, Elger CE. Limbic encephalitis: a cause of temporal lobe epilepsy with onset in adult life. Epilepsy Behav. 2007;10(4):529-538. 5. Van Sonderen A, Thijs RD, Coenders EC, et al. 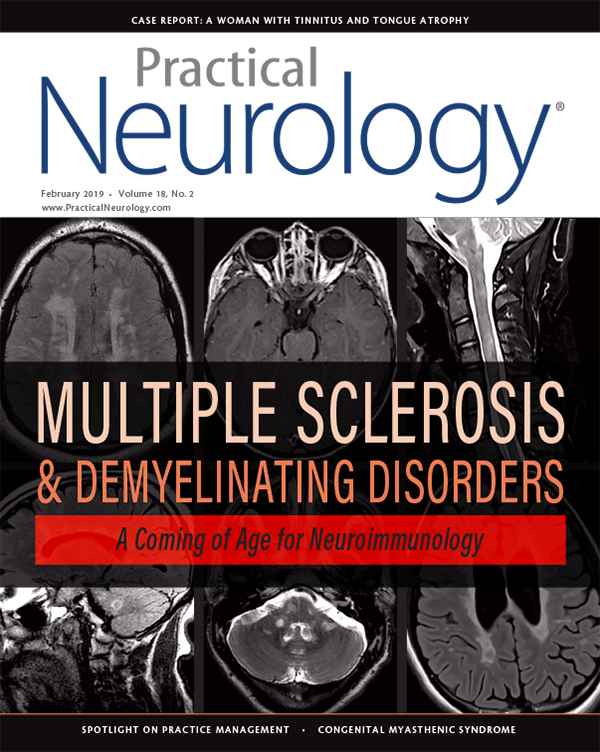 Anti-LGI1 encephalitis: clinical syndrome and long-term follow-up. Neurology. 2016;87(14):1449Y1456. 6. Thompson J, Bi M, Murchison AG, et al. The importance of early immunotherapy in patients with faciobrachial dystonic seizures. Brain. 2018;141(2):348-356. 7. Lancaster E. Paraneoplastic disorders. Continuum (Minneap Minn). 2017;23(6, Neur-ooncology):1653-1679. 8. Hor JY, Lim TT, Cheng MC, et al. Thymoma-associated myasthenia gravis and LGI1-encephalitis, with nephrotic syndrome post-thymectomy. J Neuroimmunol. 2018 Apr 15;317:100-102.